As you all know we got a dream match at Wrestlemania 18 featuring two of the biggest names that wrestling has ever seen. They put on a memorable clash that saw the return of the yellow and red shortly after. 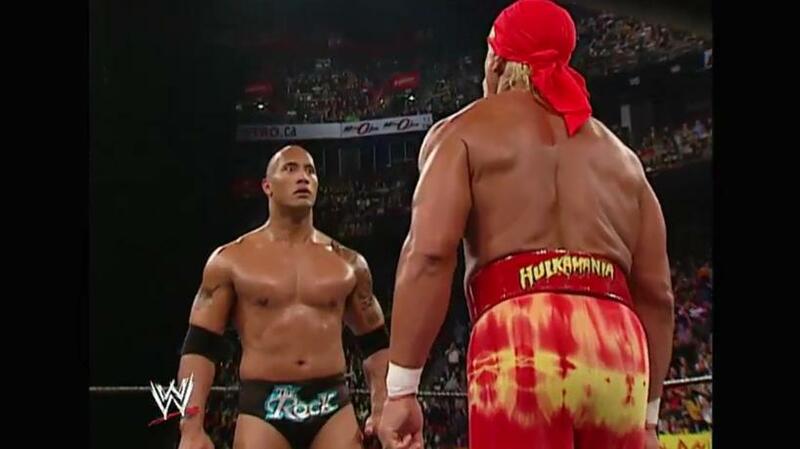 While Rock and Hogan would both win the Undisputed Title during the year, they would meet again in 2003, this time with Rock being the heel due to his jump to Hollywood while Hogan was there wrestling. We begin with The Rock stalling to get the match started. Hogan turned around and Rock would try a sneak attack only to be thwarted by Hogan. Rock would get back outside and Hogan would come out and start pummeling on The Rock but rock would gain the upper hand. Hogan would gain the upper hand by slamming Rock’s head into the turnbuckle then mocking The Rock’s spit punch. Rock would then gain the upper hand and deliver the Rock Bottom only for Hogan to kick out but Rock would use Hogan’s belt on Hogan. While Rock would sip water in a mocking manner, Hogan would counter and begin to use the belt on The Rock. Rock would counter with a DDT and then put Hogan in the Sharpshooter. Hogan would then break the Sharpshooter which tossed Rock out of the ring. Rock would maintain control with a clothesline. Rock would try to attack with a chair but Hogan reversed it and would use it on Rock. 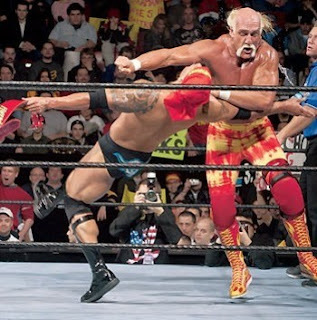 Hogan would then get low blowed by the Rock, shifting momentum again. 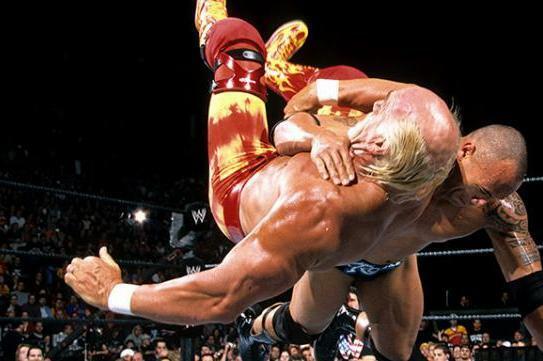 Rock would then hit the Spinebuster and attempt the People’s elbow but Hogan would Hulk up after kicking out. Hogan would then go to his Five Moves of Doom to pin Rock but the lights go out. Vince McMahon comes out and feigns innocence. While Hogan was facing McMahon, the ref slides the chair to The Rock who uses it on Hogan. Rock would then Rock bottom Hogan and the referee counts three. The Rock wins. Fun Fact: The Rock is one of the few men to have not been defeated by Hogan in a one on one match, joining the likes of Goldberg and Sting. This was a solid contest. Not a classic, but I feel like it was more entertaining than their first encounter. I felt their first match was big simply because of the guys involved. Not to say it wasn’t a great match but still. 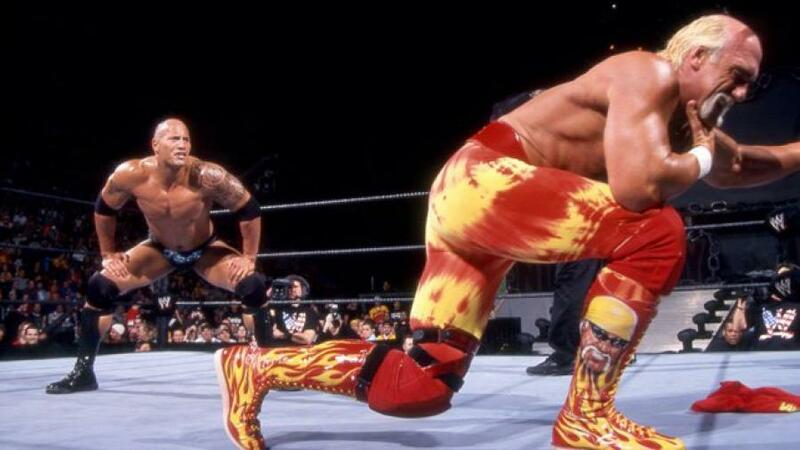 With this match, The Rock’s theatrics get you every single time. Even though this feud was more of a placeholder to Hogan vs McMahon and Austin vs Rock III, it still served its purpose. Michael Cole and Tazz did a great job on commentary but nothing compared to JR and King at Mania. Still, a good match IMO.